Sun., Feb. 18, 2018, 8:37 p.m.
Landry Shamut scored 19 points, and No. 19 Wichita State ended the nation’s longest home-court winning streak, beating No. 5 Cincinnati 76-72 on Sunday in Highland Heights, Kentucky, to leave the American Athletic Conference race wide open. The Shockers (21-5, 11-3) beat a Top 5 team on the road for the first time since 1964. They led most of the way, building an 11-point lead midway through the second half and holding on. Shaquille Morris’ dunk with 5 seconds left finished it off. The Bearcats (23-4, 12-2) had their 39-game home-court winning streak snapped. Cincinnati hasn’t beaten a ranked team all season, falling to 0-3 with losses to Xavier and Florida. 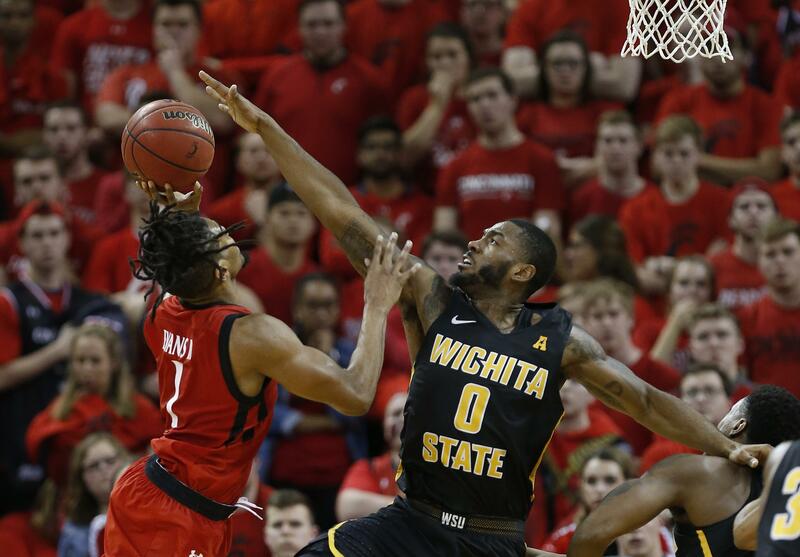 Cincinnati and Wichita State were expected to contend for the title in the Shockers’ first season in the AAC. Wichita State gave itself a chance with a solid all-around game led by its point guard. Shamut had 16 points in the first half, when the Shockers shredded the nation’s second-ranked defense to take control. (6) Purdue 76, Penn State 73: Carsen Edwards scored 27 points to lead the Boilermakers (24-5, 13-3 Big Ten) past the Nittany Lions (19-10, 9-7) in West Lafayette, Indiana. Dakota Mathias added 18 points and Isaac Haas had 12 points and six rebounds for the Boilermakers, who snapped a season-worst three-game skid. Tony Carr had 19 points, five rebounds and five assists, Shep Garner had 17 points and Lamar Stevens had 13 points and six rebounds for the Nittany Lions. The loss ended a stretch of six wins in seven games. Ryan Cline’s 3-pointer with 5:31 remaining gave Purdue a 61-58 lead, and the Boilers never trailed the rest of the way. (22) Michigan 74, (8) Ohio State 62: Jordan Poole scored 12 of his 15 points in the first half to help the Wolverines (22-7, 11-5 Big Ten) take the lead, and it never trailed in the second half against the Buckeyes (22-7, 13-3) in Ann Arbor, Michigan. The Wolverines beat a rival and helped out another rival, giving No. 2 Michigan State a one-game lead atop the conference standings with two games left in the regular season. The Buckeyes have fallen out of first place by losing consecutive Big Ten games for the first time this season. Michigan’s Muhammad-Ali Abdur-Rahkman scored 17 points, Zavier Simpson had 13 points and Moe Wagner added 12. Jae’Sean Tate had 20 points and 15 rebounds for the Buckeyes, who last lead was 18-17 midway through the first half. (12) Duke 66, (11) Clemson 57: Gary Trent Jr. hit three foul shots with 1:31 left to put Duke ahead for good and the Blue Devils (22-5, 10-4 Atlantic Coast Conference) beat in the Tigers (20-6, 9-5), South Carolina. Duke won its third straight game without Bagley, its leading scorer and rebounder who’s sidelined because of a strained right knee. Wendell Carter Jr. followed Trent’s foul shots with an inside bucket and the Tigers could not respond in losing for the first time at home this season. Grayson Allen had 19 points for Duke, all but two in the opening half. Carter had 15 points and 10 rebounds. Marcquise Reed and Elijah Thomas led Clemson with 13 points apiece. Published: Feb. 18, 2018, 8:37 p.m.